MAY SALE - save £285!! 3 nights was £1185 NOW £900!! •	Perfect for a special celebration! •	3 pubs within a 25-minute walk. Village shop 15 minutes stroll. An ideal cottage for large groups or families holidaying together with Direct Forest Access. Set in a truly stunning location surrounded by the beautiful New Forest, ponies, cows, deer and pigs will be your only visitors! Although this is a get away from it all holiday you are only a 15 minute stroll to the village store and 25 minute walk from 3 great Forest pubs. Lyndhurst is 10 minutes drive and the nearest beach is 30 minutes. Perfect for cycling on the 200km of New Forest cycle tracks the cottage has a secure store for up to 8 bikes. Bramshaw also hosts 2 golf courses for those looking for some quality time on the green together. For those looking for a simpler pursuit why not explore the Forest on foot directly from the cottage door! Meander through Bramshaw woods discovering the mystery of the ancient woodland while traversing streams and ancient waterways. This side of the Forest is quieter than some other parts so lots of areas to explore and adventures to be had. That being said it won't be long before you stumble across a good Forest pub for lunch! The fabulous games room in the garden provides the perfect opportunity to just stay in. No need to spend money and no need to worry about the weather! Why not challenge the children to a game of pool or team up with grandma for a game of table tennis? Maybe this becomes the boys domain while the girls enjoy a glass of wine watching the deer and ponies from the conservatory? Although the Forester Lodge retains many original features it has been modernised to an exacting standard and contains luxury fittings throughout. With all of the accommodation, except the twin bedroom, on the ground floor The Foresters Lodge is ideal for those not wanting to be challenged by stairs on holiday. The soft pallet of colours promote the natural surrounding and this together with the light and airy feel make you instantly relax and feel at home. Individually designed, the rooms all have their own character. The relaxed 'blue' master bedroom entices you in making you want to throw open the French doors onto the garden and let the outside in! The heavenly 'lilac' room invites you to snuggle up on the window seat with a book and watch the wildlife go by(this room can be configured as a 5ft double or 2 singles). The serene feel of the green room and fabulous Forest view makes you want to leave the curtains open all night watching the Forest go by. Whereas the fun 'red' room up stairs feels like you have just stepped into a 'gingerbread house' - great fun for the children, plus stargazing through the skylight! The Foresters Lodge has a resident large herd of deer that pass by the cottage at dawn and dusk. The conservatory is the perfect place to relax with a cuppa while wildlife spotting - whatever the weather! The lounge is cool in summer with its high vaulted ceiling and cosy in winter around the log burner - especially welcome after a nice long walk in the Forest on a winters day. Dining is made easy with a breakfast bar seating 4 over-looking the Forest and adjoining table for 8. Lots of space for a relaxed evening get-together or Sunday roast lunch. Don't forget the fabulous family bathroom with supersized Jacuzzi bath - space for 2! Drencher shower and twin basins. The perfect place to scrub up after a muddy walk or relax tired muscles after a busy day of Forest pursuits! We bought The Foresters Lodge in 2011 after the whole family fell in love with the idyllic location and character cottage. Our intention is to use it as a holiday home and eventually to retire to this serene place that is so close to nature. The attraction to our boys aged 12, 10 and 8 at the time, was the adventure of the Forest, rope swings, streams and building dens! To Ramsey and Donna being at The Foresters Lodge really feels like you are away from it all, yet you are only a few minutes’ walk from the village shop. We didn’t think such a property existed in the busy South of England. We set about fully renovating and extending the property. Today the many character features have been retained yet the property is light and airy with luxury fittings and comforts throughout. We continue to enjoy weekends at The Foresters Lodge with family and friends. The games room is still the big attraction, especially to teenage friends and this summer saw us enjoying BBQs, with the boys and their friends staying up late into the night stargazing and listening to the sounds of the Forest night whilst toasting marshmallows. We find The Foresters Lodge simply a great place to unwind and spend quality time together. 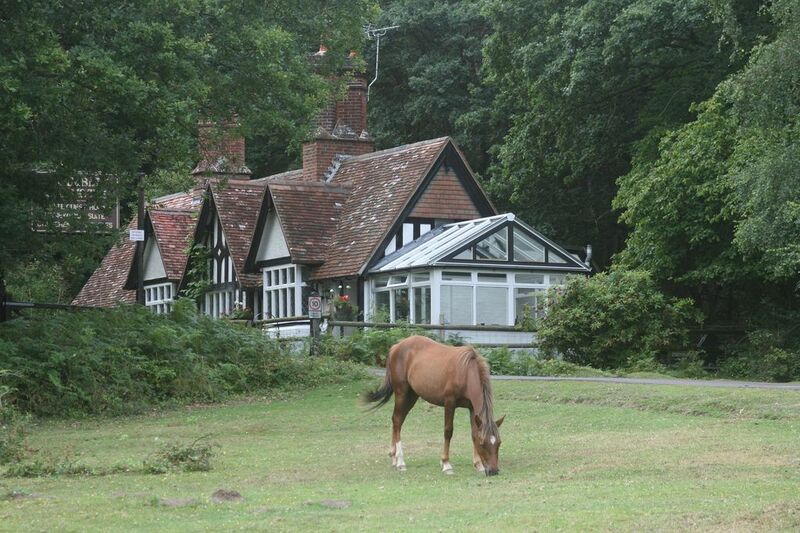 If you want the hubbub of the beaches and villages of the New Forest then they are on your doorstep, if not you have all you need for a great week away spending time together and getting close to nature at The Foresters Lodge. We hope you enjoy your time here as much as we do. Range cooker, 5 gas burner hob and hotplate, microwave, built in dishwasher, built in fridge/freezer, Belfast sink, breakfast bar. Fully equipped with cooking equipment, serving utensils and crockery etc. Games room with slate bed pool table, table tennis, table football, darts, kitchen area and cloakroom. Selection of family board games. On site secure bicycle store for own bikes. No bikes supplied. Comfortable, spacious, clean and well equipped, this cottage is even better than the pictures suggest. The games room is great for tweens/teens but there are also plenty of games/toys for younger children. Although you feel like you’re in the depths of the forest, it’s easy to reach all of the New Forest’s attractions and the coast. Good pubs nearby and lovely walks in the forest. Amazing to see a herd of deer passing the cottage as well as plenty of ponies, cows and donkeys. Lovely to have the wood burner on the colder evenings and the cake on arrival was much appreciated. A great way of reminding your kids how much fun they can have without electronic devices, we wish we’d booked for longer. Great house with a really helpful owner! House is fantastic in a great location, the games room was perfect for our group. Donna was extremely helpful. Excellent choice of venue for this family gathering. Home from home with everything you would need available to use. Fun for all the family and somewhere we would definitely return. We had a lovely, relaxing few days at the Foresters Lodge. Donna was there to welcome us after a long journey and showed us round and even left us the most delicious cake. We had wonderful weather and went out on lots of walks and hired bikes at Burley which was a great day out. The house is perfect for a large family with lots of space for everyone. The kitchen is really well equipped and the bedrooms are all very comfortable. We had the log burner on most nights which made everything very cosy. The conservatory is great for having a cup of tea and watching the animals and taking in the beautiful forest surroundings. What really sets this house apart is the fantastic games room which provided hours of fun for all of us. It was lovely being surrounded by the forest with nature all around you, the stars at night are amazing! I would not hesitate to recommend this place, and we would love to return one day. We are a family of 5 plus my mother-in-law. The cottage was really well kitted out with games and toys for the kids. The layout is perfect as the children took over the conservatory while we hung out in the kitchen and living room. The bedrooms are spacious and there’s a connecting door from the kitchen so we didn’t disturb the littler ones at night. The location is wonderful. We walked from the house into the New Forest and saw all the animals you’d expect to see! The kids could play in the woods too as I could see them from the kitchen window. All in all, it was one of the most relaxing trips we’ve ever done. Donna was great and very relaxed despite having 3 children charging around the house as she showed us around. We’re hoping to go again before the summer and would highly recommend it to anyone looking to stay in the area. We were greeted by Donna, a lovely homemade cake, and shown around the lodge. I was so impressed by the space, the photos online, in my opinion, do not do it justice. The spa bath is HUGE. There were 8 adults and my 10 month old grandson. He loved crawling everywhere. We had the log burner going most evenings. The huge oven range worked brilliantly for all the mouths to feed. We took meals to cook with us, the kitchen is very well equipped. The games lodge in the garden is great, we had fun up there. We ate out at the green dragon just down the road one evening the food is excellent, very very impressed, highly recommend. We visited Beaulieu motor museum, Bournemouth oceanarium and drove around various places. We had a fantastic week. We had visitors outside the lodge, horses, deer, squirrels and cows. The horses just looked in the windows at you. My little grandson was mesmerised by the horses, He got so,excited when he saw them. We went on a lovely 5k walk. It’s a perfect place for walking or relaxing or both. Spa bath relaxed us in the evenings. Would definitely recommend this lodge and thank Donna for making our stay so comfortable. New Forest Tour bus stops outside the Green Dragon (20min walk) and runs from June - September. Jump on jump off the buses that travel around the whole of the New Forest with fascinating running commentary about the Fauna, Flora and History of the Forest. Lyndhurst - 5 minute drive. New Forest Visitor Centre and museum. Independent shops, cafes, restaurants, old fashioned sweet shop and Ferrari showroom. Romsey - 15 minutes. Market town with Abbey and independent shops. Waitrose, Aldi. Furzey Gardens, Minstead - 10 minutes. Garens, with fairy trail, tearooms and artists studios. Longdown activity farm, Ashurst - Feed the animals, trampolines, ball pits, tractor rides. All weather. Bramshaw village store - 10 minute walk. Stocks most basic items. Nisa store West Wellow - 10 minute drive, wine, organic meat. Morrisons just off Jct2 M27, 1st round about south on A326 - signposted left to superstore - 15 minutes. Booking Notes: Please contact owner. You will be asked to complete a booking form and pay a deposit of 30% of the holiday cost to secure the booking. Full payment and security deposit will be due 8 weeks prior to arrival. Changeover Day: Weekly changeover day is Friday, however this changes to Saturday during busy summer holidays. We can be flexible during quieter time.